… for a number of reasons. The dish I’m putting on the spotlight riled me up enough to eke something out of the brain sort of filled with bothered thoughts at the moment. Ihsay’s dining area and their condiments dock. Weee! I found out about Ihsay’s from foodie friend, Joy. (Thankies, you!) She liked the page, I saw it on my newsfeed, and I browsed around the page. Seeing it’s open 24 hours, Monday to Saturday, I wanted to go right there and then. The time then was 11:00 p.m. That didn’t fly … because I was half hearted and my ride thought it was a bad idea to go food questing in the wee hours of the morn. *hihi So the next day’s dinner was set at this carinderia. But that’s no issue at all. Race and I gladly had a repeat of the batil patong for late lunch. ^^, This time, we got ourselves a special plate each. (A plate that seemed to be a pancit batil patong cornucopia. Subo kami ng subo, parang hindi nababawasan! =)) ) And just as it is in their main branch, Ihsay’s, they have a fab egg drop soup that goes with the meal. Do you think it’s authentic? Ihsay’s pancit batil patong? Hello there, Pauline B.! I haven’t really been to Tuguegarao so I haven’t tasted a true blue pancit batil patong essentially. I’d say though, this one for Ihsay’s Original Pancit Batil Patong and Carinderia is a good plate of pancit, a nice protein packed filling one that we thoroughly enjoyed. Hope this helps. Happy eating at Ihsay’s or Moe’s! Thanks for visiting Find Good Baguio Foods. Hello there, Jennifer bariuan. Please scroll down to the bottom of the blog post, the address is there. P.S. I don’t own Ihsay’s. This page is just an online diary of our dining experiences in food trip city, Baguio City. I only tried the colorful burger feels from Moe’s Snack Hauz. It was good. Also very affordable. Ill try the batil patong pancit next. Hello, Shanna! Thank you for the feedback on Moe’s Snackhouse’s colorful burgers. I’ll be sure to get one or two together with the batil patong when I return to Moe’s. Super sulit ang food sa Ihsays!!!! Masarap pa!! The batil patong in Ihsay and Moe’s have the same price? Thanks Xine! Find Good baguio Foods is the best!! Hello, Lina. 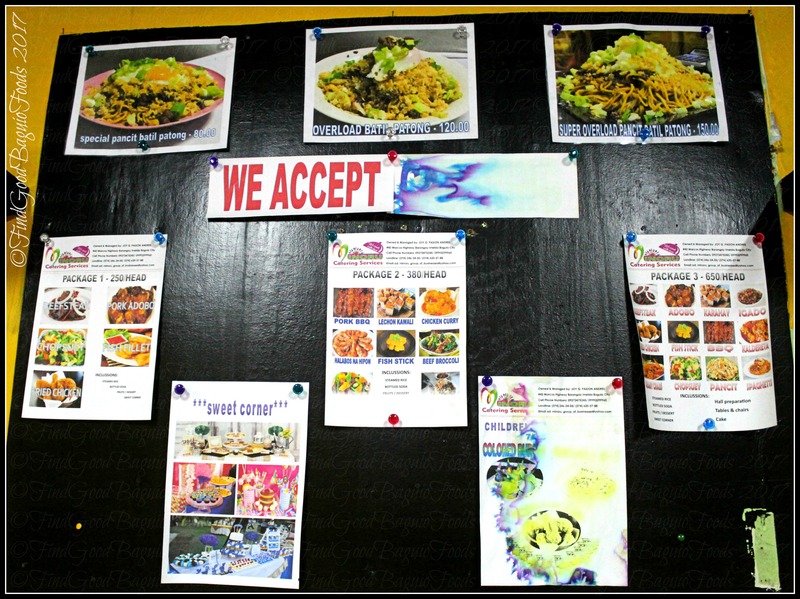 Yes, Sister eateries Ihsay’s and Moe’s have the same prices for their pancit batil patong.